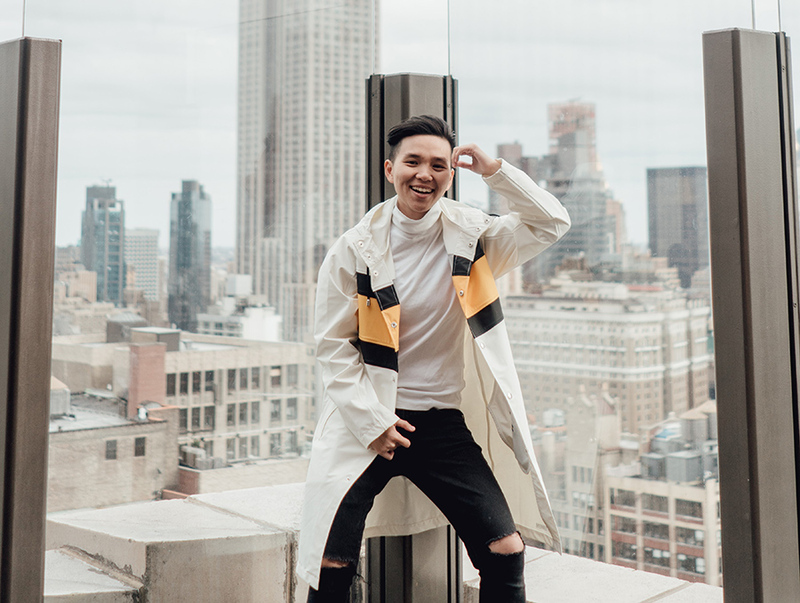 New York-based Myanmar photographer Kim, also known as The Street Sensei, has earned coveted opportunities to work with international brands, and has worked in various media including world famous magazines Forbes and Vogue. The talented young photographer was also one of several street style photographers who appeared as models in Vogue in September 2018 for the “Tom Wood x Kelly Harrington Denim capsule collection”. The collection showed the lifestyles and fashions of inspiring young street photographers. Before the Vogue appearance, she was mentioned in Forbes magazine’s #Sheshistory campaign for International Women’s Day back in March. And many of her fashion shoots were published in Paper and V magazines. “I was super honored to be published in Forbes. This was definitely one of the highlights of my life,” said the 26-year-old “tomboy”. She added, “When I was growing up in [Myanmar], I could only dream about something like this. So having it come true in real life is such a blessing.” Kim shared her special moments with The Irrawaddy while spending some time back in Yangon working on a photography project. She has worked for various well-known brands including Tiffany and Co., W Hotels, Maybelline, Huawei and H&M fashion, whom she counts among her regular customers, though it was New York Fashion Week that marked the beginning of her long photographer’s journey. Kim left Myanmar at the age of 14 and studied Asian Politics & Culture at Franklin & Marshall College in Lancaster, Pennsylvania. The college requires all students to take one art class, and she chose photography. “That was the beginning. At that time, I never knew that I would become a photographer one day,” Kim said. Later, she started capturing everything in front of her, as well as making fashion portraits of friends. “After graduation, I had more time. Before becoming a photographer, I was so interested in fashion. I’ve always tried trying to stay up to date with fashion weeks and bloggers,” she said. One day in 2015, with New York Men’s Fashion Week coming up, she texted the popular young blogger Dathias Godfrey to say she wanted to capture all the moments with him at New York Fashion Week. “I just tried to reach him and he said yes. That was my very first step into this industry,” Kim said. Then, she found herself working as a photographer. “I was so happy—even without drinking. It was physically tiring, but that was when I knew that this is what I love to do,” she said. She started polishing her photography skills that day, learning from inspiring photographers online. She adopted the name “The Street Sensei”. “’The Street Sensei’ was given to me by one of my friends from New York. I like street style and culture, and shoot a lot of street fashion photography. And ‘sensei’ means ‘master’ in Japanese—most people know this word. So, my artist name became ‘The Street Sensei’,” Kim explained. In the beginning, she wasn’t paid for her photography because she just collected experiences. All she knew was that she wanted to capture every moment, she said. She soon established a network; Godfrey helped her with many things, and they became best friends, she said. By 2017, she had already been to many New York Fashion Weeks and done a lot of street and fashion photography. Many clients started to notice her. “The main struggle is that I don’t know the pricing, marketing and how to negotiate, but Godfrey helped me loads,” she said. She said clients hire her because of her different points of presentation. They want what she has to offer and what she can do. “I’m always trying to go beyond the normal,” she said. Kim’s style is definitely fashion-focused, but with a street twist and a dash of storytelling. It’s somewhere between lifestyle and fashion. “The clients tell me the concept for the project and give me full creative control. That’s amazing. They believe in my vision,” Kim said. Of course, she works with a lot of top local models and bloggers as well. Kim became noticed locally through her fashion videography of local supermodels, and her travel videos. “I haven’t worked in Myanmar before. Supermodels come to New York for fashion weeks and I shoot them. This time, I came here with a few projects,” Kim said. She collaborated with “The Moment” and organized a talent-search event called “Push Your Boundaries”. They will choose the best models together. Then, they will train them to become influencers in the future, Kim explained. “And I have some photo shoots for fashion magazine,” she said. In New York, the clients will ask for many things to be done because they have paid you. In Myanmar, if the clients have a budget, their desired marketing strategy is still very traditional, because Myanmar is very religious and very traditional, and she has to respect that. “I’m OK with it all; I like challenges like that. So, that’s the only difference. I literally fight with them to get what I want. Because, at the end of the day, it’s my name on the damn things. So, I want to make sure it’s good,” Kim said. The fashion industry in Myanmar is really strong, she says, and she believes some of the supermodels in the country could work on international catwalks. “I think the talent here is so good. Some models are really professional and they could be on International catwalks. They try so hard, they do research, catch updates and always listen to what’s trending,” Kim said. She loves working as a photographer because it doesn’t require working in the same place, city or country. It can be done anywhere. “Now everything is digital; everything is going digital. If we have a good image and network, we can do our work anywhere and earn money,” Kim said. Kim urges local young talents to do what they love and love what they do. She plans to go back to New York and shoot, then travel to other cities and work. Then she wants to come back to Myanmar and shoot. “I will collaborate with other young talents from Myanmar. The young talents are so inspiring because I was there [in the same position]. And then someone found me; I want to, like, give back,” she said. She added, “I want my own cool studios, both in Myanmar and New York. Ha ha! Is that too much? People are really lucky if they get to do what they love. It’s really a blessing if people get paid to do what they love. If people get paid to do what they love, that’s the dream. Now, it’s like I’m living the dream, but then there’re more dreams, because you can’t just stop,” she said.